Did you know that even though your materials are regularly picked up by standard haulers, they aren't always recycled? Due to the inefficiencies of the traditional recycling method, approximately 80% of the materials you place in your containers are sent to landfill. These inefficiencies are what inspired our founder to find a better way. With RoadRunner, 99.9% of the materials we collect get recycled. We've put together a resource that explains how our offering differs from traditional methods. The Single-Stream Recycling Method: Most traditional haulers use single-stream recycling collection - also commonly referred to as "single blue bin," or "all in one recycling" - in which all materials (paper, plastics, metals, glass, cardboard) are mixed together in one garbage bag or one dumpster. The major flaw with this method is contamination. When your valuable recyclables are placed amongst dirty materials in your container (food waste, Styrofoam, etc...) the value that existed for the recyclables in the first place is wiped out by contamination. An average of 80% of recycled materials still end up in landfills due to this method. Traditional Hauling: Traditional haulers use inefficient garbage trucks to facilitate the pick-ups of your materials. These trucks typically get between 2-4 miles per gallon, and travel far distances across cities to transfer the materials to the hauler-owned recycling facility. 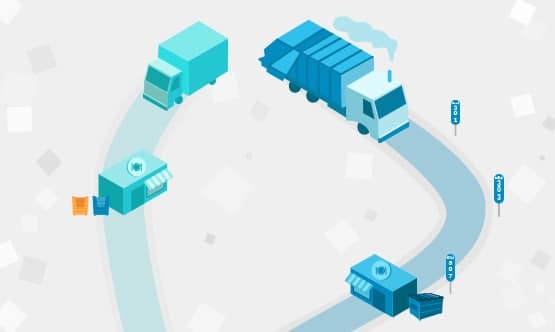 Traditional recycling methods are so outdated and inefficient that it makes more sense, from a profitability standpoint, for traditional haulers to landfill recyclables. Sorting-center: Sorting centers are the next stop for your mixed materials. They're typically located 30+ miles outside of densely populated areas due to their size and unappealing aesthetics. During the sorting process, a combination of humans and machines sort through massive amounts of materials to collect those that are valuable. The high contamination rates can ruin the entire load and halt the process at these facilities. The inefficiencies of this process result in 60% of your materials going to landfill during this phase. Altogether, only 20% of your valuable materials are actually recycled, the rest is sent to landfill. The problems from the ineffective collection method, expensive hauling, and inadequate sorting centers are passed onto the customer which results in over-priced waste services and only recycling a small portion of your materials. Clean-Stream Recycling: Our recycling method starts with the customer. We're big believers of the clean-stream recycling process, in which materials are sorted by stream: Cardboard, Commingled (glass, aluminum, plastic) Mixed Paper, and Compost. This approach eliminates contamination and retains the value of your materials, which is the entire purpose of recycling. RoadRunner's Hauling Solution: FleetHaul is RoadRunner’s solution to traditional recycling. We partner with reputable local fleet-based drivers to transport your clean recyclable materials to local buyers in your town. Our FleetHaul teams use more efficient trucks, eliminating the need for expensive garbage trucks. FleetHaul is the most efficient, cost-effective and environmentally friendly option to move recyclable materials from the customer to the end buyer of the material. Local Community Buyers: Because your materials have already been sorted, FleetHaulers drop off the materials directly at a local buyer or recycling centers in town, completely removing the need for sorting-centers all together. 99.9% of your materials are recycled locally, benefiting you and your community! By making recycling more efficient, we are able to reduce costs associated with responsible operations; meaning your business spends less and recycles more with RoadRunner.